This post has several things going on. First: Tiny Swagtastic Weekends! They held it last week but I was out of town, so this is my first week (and 2nd week of Swagtastics) so how exciting. All the participating Tiny merchants are putting an item marked down to 50 $L for the weekend. Wait wait.. keep reading. I know most of you see “Tiny? Pfft” cause you’re all human and stuff. Wait though. I dunno what is available from the others yet, but mine is textures. So this week you’ll be able to get a set of textures marked down from 75 to 50 $L. So come shop, I’ll have it set by 8pm SL tonight. It runs all weekend till late Sunday night. I know which textures already, it’s set up on the 2nd floor of the dollhouse on the little table. You can join the group by clicking the sign under the table too btw. Groupless group! Then you’ll get the updated list so you can check all the shops involved. You can also see which textures I plan to offer starting tonight too. Next up: Lack of adventures. Last week with vacation, and this week my husband managed a couple more days off. Yay! Our original plan was to go be tourists in a neighboring town haha but instead, we’re doing a couple home repair projects. I am sooooooo excited about them too. I’ll tell you later Valla, it’s great and I built something woohoo. P.S. My rhubarb must of been a dud, nothing’s happening. I’ll try again next year yay! I keep meaning to tell you but I always forget. Last thing for now: Do not forget, I am in two treasure hunts. One you need to fish the prize up using 7seas rod (no bait needed) and the other you’ll need to hunt around my shop for. You’re looking for a smiley face w/ a paintbrush. Today they released the developer pack to create custom fish. I am so excited! I didn’t expect it to be ready so quick to be honest. But yay for all of us! P.S. It is so aggravating that WP defaults to “most used” rather than showing me all my tags unless I click that option ever single blog entry. Hissss… nomnom. I was shocked, I really thought I’d just be hopping empire to empire haha. So instead, I’ve turned down several gold-to-change invites because well really, how nice is it to be invited into a group and welcomed by a real person!? Seriously nice! So now I’m a Dame! Dame Lorimae Undercroft of Northwoods. I have an ox and a shovel so far. No subjects though, at one point I did get a little notice that someone, on my behalf, was trying to find me a subject but I don’t know how long that takes to process. So I guess he said no haha. It runs as a nicely designed HUD on your screen,and you can minimize it down into a rolled up scroll. It’s very neatly done! The sound can be turned off too if you click the wee clock icon and hold for a coupel seconds. There’s also a Tiny Empires group, well there’s a ton but the one that’s official will say so in the charter. Has tons of people, just IM one of the people it says for an invite. Despite what I had original thought when I first heard of it last month, it has nothing to do with Tinies as in the tiny avatars. I fished up the blueprints for the innertube a couple days ago, today I fished up the pump I think I need for it! Then I just fished up the Oceanography Database blueprint! I have no clue what that is, but hoo!! Went out to join one fishing contest but it wasn’t running, so now I’m fishing out at the Fishing Hole to seeif the contest at noon begins but it’s 4m till and not looking like it’s happening. It’s a good peaceful spot to fish. I’m still debating if I’ll add 7seas to my lot, I really think I will but I need to build a cute fishing spot. My only holdout is I have to measure my plot, I think Jen said the fishing node is 20m and I think my plot is about 18m wide. Hoo! I just fished up the left boot! Now i have a pair! 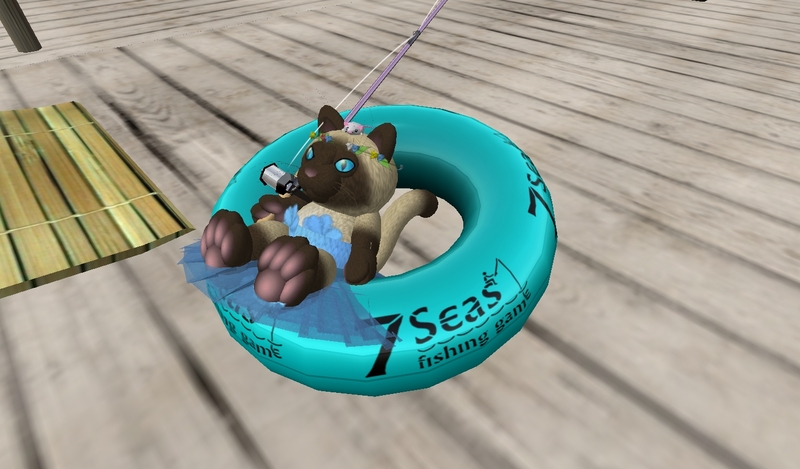 I also fished up fishing hats but they do not fit my kitty and they are unresizable. I’ll fix my kid shape up in fishing gear instead :) Some of the fishing spots are kid safe too. One of them, and I’ll have to get back to another entry to add the LM but it’s spectacular. Fishing, freeplay games, and it’s just nice. They have this ocean game that’s a bit like battleship and bingo, then a scratch off game too. Both are really fun (and they have freeplay versions). I’ll get the LM later so you guys can play too. Nope it’s Noon, and no one here to run the game. Too bad! I’ll have to scope out the event’s list for 7seas and see what else happens today. I have a class at TUi later I want to take on textures in Gimp. I have it installed and can get around the basics but I’m used to the Photoshop basics.. my skillz are lacking. Oh yesterday I took one of the most fun classes. At TUi with Previous Page. She ran two yesterday, one was just sorta weird. The class is “Evil Eye Visitor Tracker” but really, it’s just weird. You should take it, it was fun. You sort of make a stand, then the eyeball moves to the nearest person I think. As a tiny, the eye didn’t do very well until I flew up in the air haha. Then her second class, I definitely insist you take! We made snowglobes! :) I’ll get a photo of mine in a bit to post up. I’m proud of it! It’s a great class, very free form. You make a base.. what ever size you want. Then you put stuff in, she gave us some flower textures and not sure what else. Have your library inventory ready to go, you can add tress, or build benches, or build an animal if you want. It’s a snowglobe, and you can put anything you want in it. I built a fishing hole with dock, pole, worms, tulips, and fish! I love classes like that, it’s like a blitz build (speed building contest) only.. not quite. I think it was a level 3, but you can do it. Just know how to rez prims and resize and have some creativity that’s all you need. Plus, you can always work on it after class. I finished mine afterwards at my house. It has Mr. Nomnom’s cousins swimming around in it. Take the class. It’s fun. I’ll get a photo of my toilet I made at TUi with Diff (I forget her last name, maybe Schmooz?) and that class was hilarious, I can’t remember if I blogged about it. That was last week though. I need to take the NCI Griefer’s class sometime, I keep forgetting to go. I think maybe it’s on the weekend and I’m usally busy or in another class. Well dang it, no contest here for sure. 6 after and I’m all alone to pee in the ocean. Seriously, I love this fishing area. I’m thinking about getting their fishing game pack to put at my house in my lake, but I need to get around to asking about the minor details… namely size of the whole thing. My lake is wee small and my property is very narrow. I don’t want to have it cut over into the next sim or into my neighbor’s plots. They have a fun game by the docks too, if you go inside to the arcade and pick up your ticket-roll. Wear it, then play. You’ll earn tickets toward their little arcade prizes. Yeah, it’s dorky.. but it’s fun! 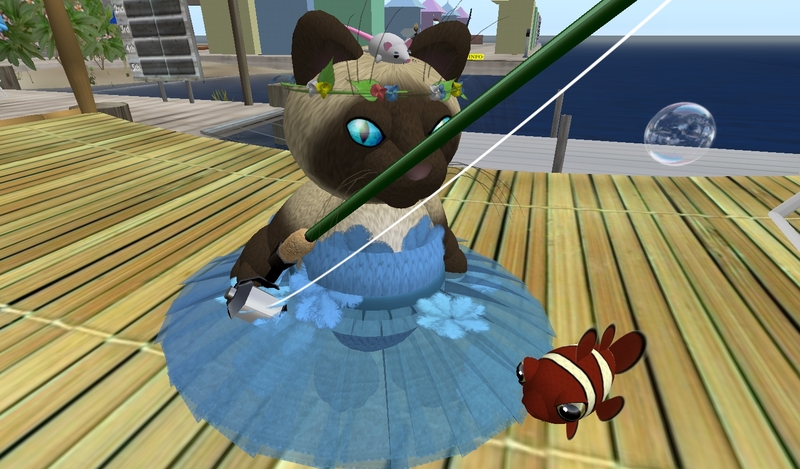 You can even name the fish you catch while fishing, and enter them into the aqua game. Mr. Nomnoms has done pretty good. I train him solo, so far he’s not competed against others. Today my Pro Fishing Rod dinged level 1! It made a noise and announced it to the nearby fishers too! Neato! I still haven’t got my tiny rod yet, I think that they just officially got released so I’ll send another IM soon maybe to exchange my human version for a tinies version. I’m kind of getting attatched to the normal one though. If I spin around, I can hit people with it. Not… that I um.. do that you know, that’d be a bad cat situation. I’m a good cat.